In previous parts of this series on parenting lessons from surah Luqman, we talked about the essential prerequisites of parenting (Part 1), and the importance of instilling tawheed and iman in our children, so they can avoid committing shirk (Part 2). This part focuses on the next piece of advice in surah Luqman : taking care of one’s parents and being grateful to them, and how we can imbibe these qualities in ourselves and our children. When I became a mother, I realized how much my mother sacrificed her comforts, her habits and her lifestyle to give me a beautiful childhood. And as I further tried to gather useful tips from other successful parents, I saw the same sacrifice from them. One father even gave up his opportunities to garner international acclaim just so he could be with his children and not travel. Subhanallah! All this was done happily and without expecting anything in return. No wonder Allah commands us to be good to them and to be grateful to them! Each child has a unique nature. Some are naturally loving and caring, some find it hard to be expressive. I have also come across some parents who lament that their children, however loving and concerned they are, do not feel it their duty to be good and obedient! Dua is the first step towards accomplishing anything. It ensures Allah ’s help without which nothing can be accomplished. Even if your children are, say, in their 40s, continue to make dua for them, as it is never too late to ask Allah ; He always responds. Children model their parents’ behaviour. If they see us taking care of our parents, seeing us checking up on our own parents regularly from afar (if they don’t live nearby), getting things they like or need, meeting them often and helping out in their chores, then In sha Allah, taking care of us will come naturally to our own children. The second part of the ayah above is also a dua that parents must make on a regular basis, especially as it covers dua for our parents and children. One thing that should be avoided is not letting the child know that you are tired or need rest, love and care. Simple chores such as these which they can do easily, presented to them in a loving and gentle manner must be a routine in our homes. But do not forget to somehow make it fun for them! Remember: Children love to learn, but dislike being taught by rote or force! Let us ensure we have our children in our vicinity or on our prayer mats or go along with us to the masjid so they see us make dua for our parents. It is a good idea to start with very simple duas such as the one above and shorter ones further above, In sha Allah. Express your happiness when they do good deeds and tell them that you are happy for them and yourself. So every good deed, every act of piety, righteousness and good trait that we encourage in them which goes on to become a part of their character or a notable characteristic of their lives, will yield us rewards well beyond our lives and into our graves, even after our own acts of ibadah have stopped benefiting us (except recurring charity). Implementing and teaching gratefulness to our children is important. Studies on this subject tell us that being grateful makes people happier: it teaches us to focus on what we have instead of what we don’t. “By learning gratitude, they (children) become sensitive to the feelings of others, developing empathy and other life skills along the way,” says Barbara Lewis, author of What Do You Stand For? A Guide to Building Character (for kids). Children (and adults) who have a grateful attitude look outside their one-person universe and understand that their parents and other people do things for them: prepare dinner, give hugs, buy toys, wash clothes, clean up rooms and the list goes on. “On the flip side, kids who aren’t taught to be grateful end up feeling entitled and perpetually disappointed,” continues Lewis. A grateful attitude towards life will benefit our children when they grow up. 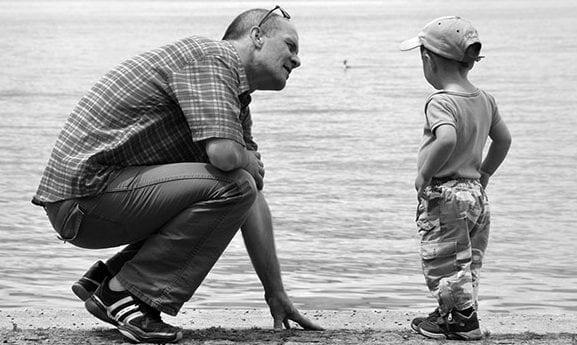 Children learn by observing and imitating their parents, loved ones and role models. So we have to do it ourselves too. If our children see us saying, “Alhamdulillah” after eating our food, or wearing new clothes, or buying something new for the house, or upon landing a new job, then they will do it too. Children are best led by example! Every time we observe point 3 in the previous section on caring for parents (assigning chores and simple activities to children) and involve them in helping around the house, be sure to say a big “thank you!” to them and in the same breath thank Allah as well. Thanking them for their work goes a long way in helping them to learn gratefulness, and teaches them the value of emotions one feels when one does something good and hears a heartfelt ‘thank you’ in return, especially from elders they love and look up to. It’s a fun and rewarding practice to sit down with our children and make a list of the blessings of Allah . We must find the time to do such things as taking strolls with our little ones under starlit night skies thinking aloud about the wonders of the universe, how tiny our earth is and how lucky we are to be here; protected and provided for. We could, for example, refer to surah Nahl where Allah tells us how He created the cows, horses and donkeys that provide us with food, and to use to carry heavy loads so that we don’t have to. And about how He sends down rain that bring water to us, used by plants to grow; and how He has created fruits like grapes and olives for us. Allah mentions in surah An Nazi’at that He created the mountains standing firm which hold this earth together so that it does not shake and how we can stand on it without falling off and about the stars that we rely on to guide us during the night! Exercises such as these have helped my daughter countless times to marvel at and be grateful for Allah’s blessings. Make a habit of helping others: holding doors, help carry the grocery for someone, help a sick relative or friend. Inspire your child to do it too. When they hear a ‘thank you’, it teaches them to say it too, In sha Allah. Some children are born with a complaining streak in them and some develop it over time perhaps due to difficult life situations. My daughter developed hers during a rather long period of difficulties that we faced as a family. It became really stressful for me to hear her complain and only point out the negatives even when things started to get better. However, recalling these above qualities of people to whom Allah has promised The Garden helps us adults to be more patient at all times, as best as humanly possible. This last point about being patient is one that is best approached through teaching by demonstration and by example, and is likely the most challenging of all for us as parents. So don’t lose your patience when your child is not doing what you want him or her to do. Continue to make dua and work harder; remembering that Allah Always helps. I pray that this article was beneficial to you and your family. In sha Allah, we will meet again and learn how to act upon the next piece of advice by Luqman : establishing salah (prayer) in the lives of our children. Please share your thoughts and experiences in a comment below on being grateful and caring towards parents.